As I was fighting those mean old dead vines today I was also praying that anything in my heart that needs to be dealt with would be revealed. My family and I moved to a blackberry farm a little over two years ago. As parents, we wanted our kids to learn and experience farm work and have the great outdoors to roam around in and play. We will never take farmers for granted again. The amount of work growing food on a commercial scale is staggering. I remember that upon hearing about our move, one of my friends was so excited: “Think of all the spiritual applications you will have to teach the kids! Sowing and reaping…” she exclaimed. I was happy about it, but not nearly as excited as she was. Now I get it, though, so please let me pass the vision on to you. Today as I was pulling out the old vines that my husband had cut from the blackberry plants, it dawned on me—as it does every year—that in order for the plants to grow, bloom and get the most and best fruit possible, the old growth has to be cut and removed. This isn’t fun; There are roughly 3 acres of berry plants. Sometimes the old vines are bigger than the new ones and are tangled up with the new growth or the wire trellises. They can be literally twisted around each other. I constantly get scratched or whacked in the face with the branches. It’s easy to miss the dead branches at times because they can blend in with the new growth. 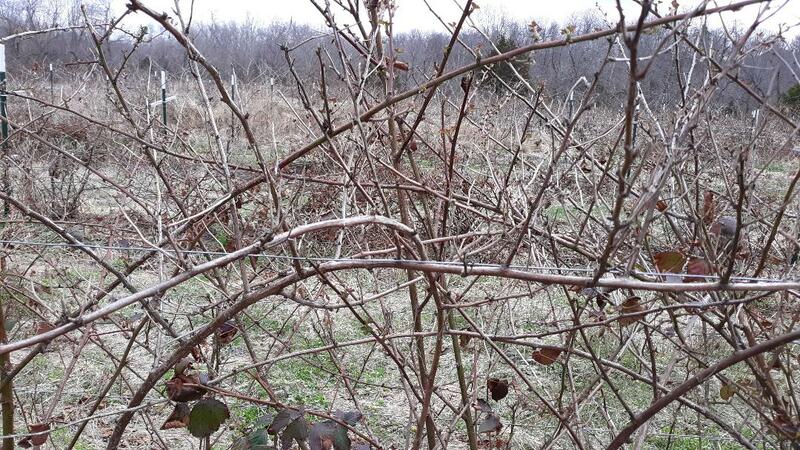 The dead branches, if not pruned, would get in the way of this year’s harvest. My husband trims, and the rest of us pull out the dead branches and collect the vines for the brush pile. Do you see it? Do you see one of the spiritual applications my friend Alicia was talking about? Now, I am not about to get into anyone’s religious business (this is a natural health column after all), but I will say I know there is one Creator. The same One who created these blackberry plants created you and me. He knew they would need pruning…as well as us. As I was fighting those mean old dead vines today I was also praying that anything in my heart that needs to be dealt with would be revealed. That He would prune me so I can best glorify Him. This seems to be a constant process as I never seem to arrive at some spiritual plateau. There are always fruitless branches to cut from me. I wear a necklace another friend of mine, named Sophia, had designed and made. She literally drew the idea, crafted a mold and used boiling silver. What makes it even more meaningful is the tree design was based on scripture, as seen below. I firmly believe that as people we should be learning, growing and changing as the days and years pass. This necklace reminds me that it is only through Him that I am able to do the things I do; it’s not in my own strength, I can assure you. As we spring clean our homes, gardens and bodies I ask that you not miss the most important area…your spirit. Your spirit affects everything, and I do mean EVERYTHING, even our health. While it may not be ideal to be slapped in the face—whether it be with a vine or a problem or situation we need to deal with—the result is so worth it.